How much a Joe fan likes Shipwreck seems to indicate whether he or she is primarily a fan of the cartoon or the comic series. 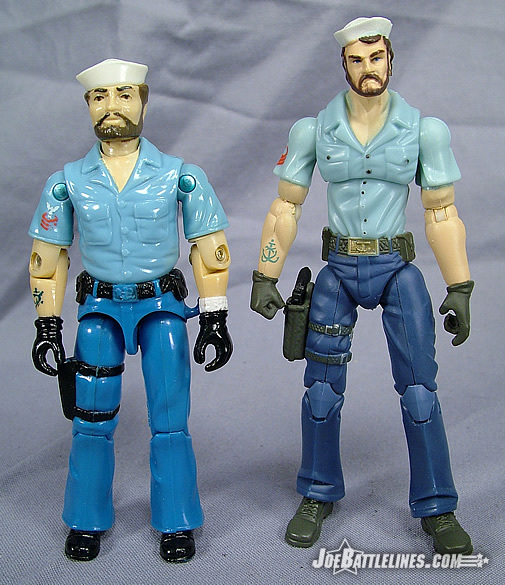 Debuting in the second animated mini-series “GIJoe: The Revenge of Cobra”, Shipwreck quickly became prominent member of the team, edging out many “older Joes” for screen time. His cocky attitude delivered with a Jack Nicholson-esque drawl quickly made him a favorite with audiences who saw him as a “key part” of any episode. By contrast, Shipwreck’s appearances in the Marvel Comics series were far less frequent with a smattering of appearances between issue #40 and #80. He was also depicted in a more serious fashion with the “swagger and drawl” noticeably absent. It wasn’t until the revival of GIJoe: A Real American Hero by Devil’s Due Press that Shipwreck began to get more “panel time” culminating with his inclusion on the “core team” of the America’s Elite title. Regardless of which continuity he comes from, Shipwreck is now a member of the 25A line and the result is better than one might expect. Like many figures in the 25 th Anniversary line, Shipwreck’s body design is fairly basic. The Joe team’s first sailor’s uniform consists of a light blue short-sleeved shirt worn with a pair of dark blue dungaree pants. 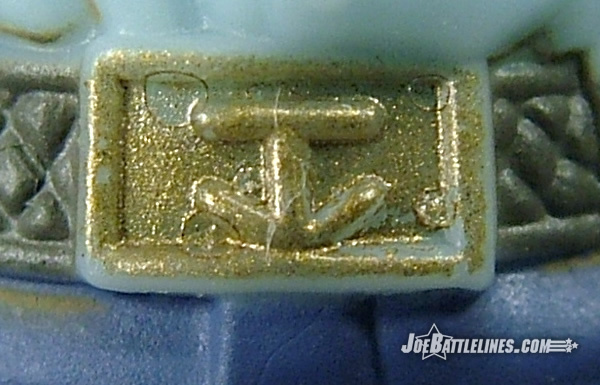 Shipwreck’s boots, holster, buttons, and belt are all painted dark gray while the anchor buckle of his belt is painted gold. A red rank insignia adorns his right sleeve and his swivel wrist gloves are also painted gray. It’s a very basic color scheme that is completely faithful to the original as well as visually interesting in a minimalist fashion. The only other adornment on the body is the tattoo which is rendered on his right forearm. 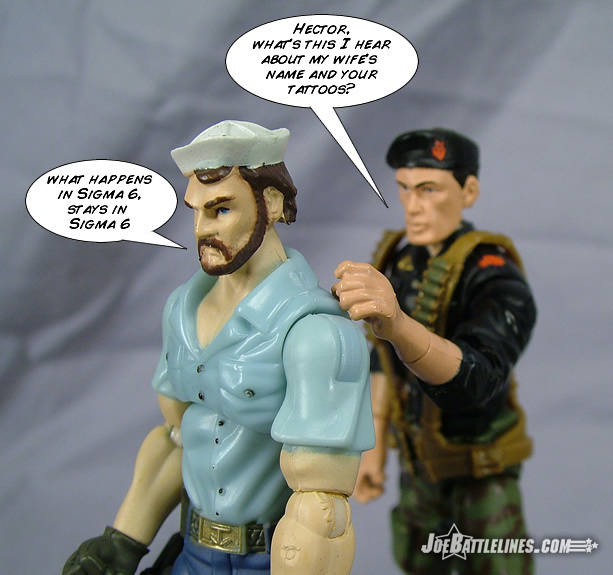 The original 1985 figure featured a shark and anchor tattoo; the 25A version splits this design into two distinct variations. 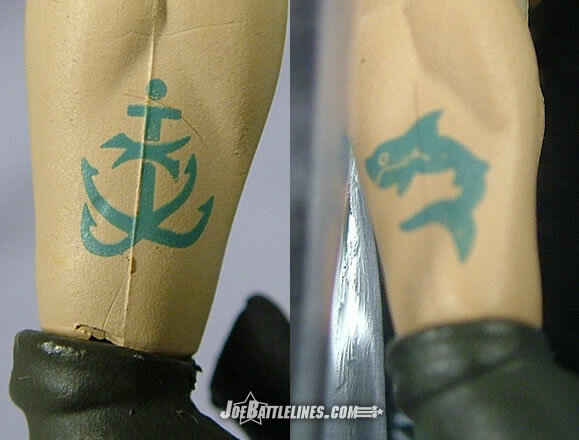 The Shipwreck figure can be found with either an anchor (which some fans think resembles a grappling hook) or a shark tattoo. It would seem that Hasbro has carried their penchant for “variations” over from the Sigma 6 line as this is the second major intended variation to be found in the line. (The first major variation is found in the two different colored versions of Timber included with the single carded Snake Eyes v2 figure.) As of this writing neither tattoo has been proven to be rarer than the other, however, I would suspect that that the shark is the likely candidate. Thus far I’ve seen a total of four Shipwreck figures either in stores on in the hands of collectors and the split seems to be 50/50. However, the card art depicts Shipwreck with an anchor tattoo—just as the card artwork for Snake Eyes featured a gray Timber. (The black version of Timber has proven to be the rarer.) Personally, I’m more partial to the shark only because the design is a bit more dynamic. 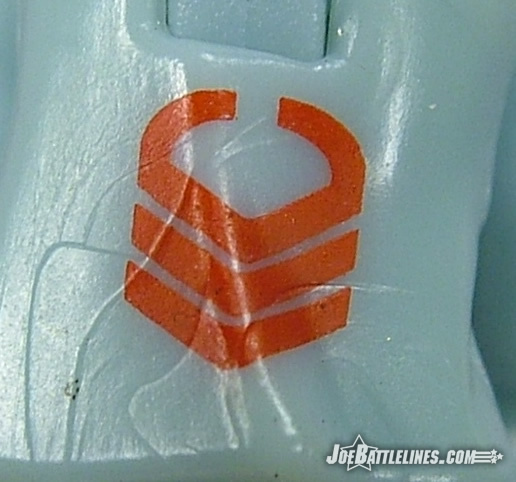 Also, according to a post at JBL by Shipwreck, Jr the shark insignia is close to that of Naval Coastal Warfare group 1 which is stationed in San Diego, CA—Shipwreck’s hometown. 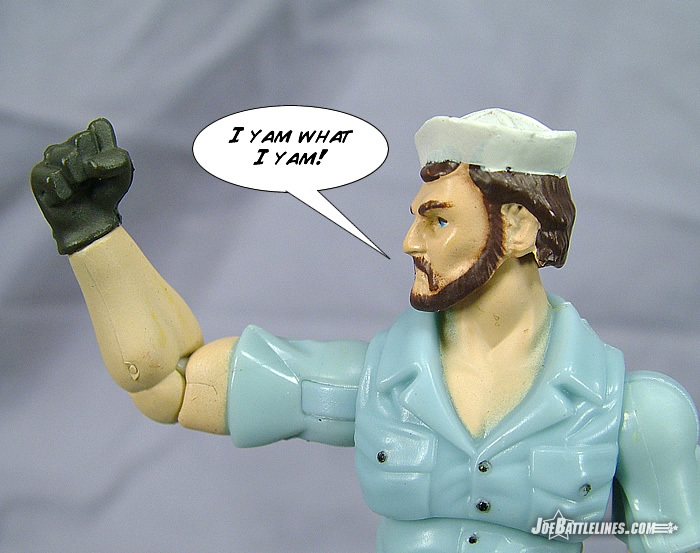 So, in terms of body design Shipwreck’s is a fairly basic but solid emulation of his original figure from 1985. 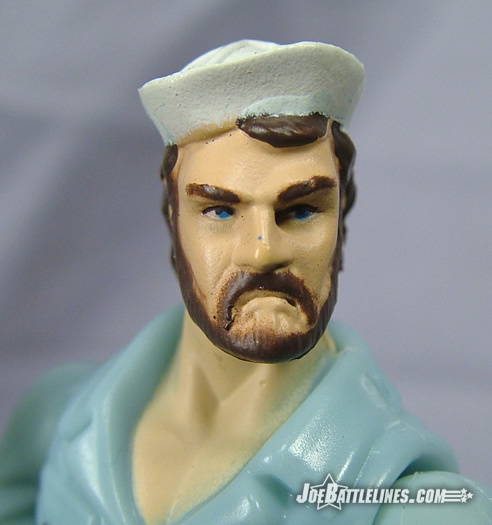 I’ve read a few comments here and there by fans who state that Shipwreck’s head sculpt “isn’t very good”. 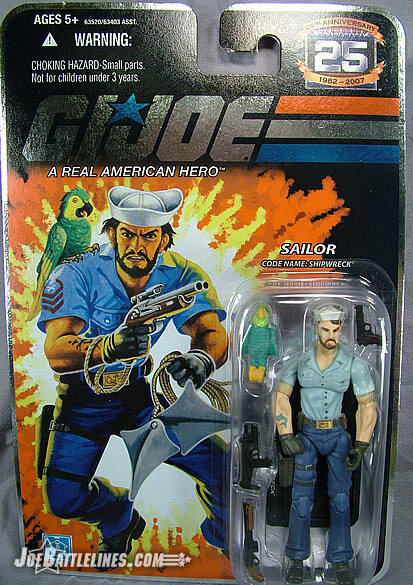 While it may not be a perfect representation of the Sunbow incarnation of the loud-mouth sailor, it’s a pretty solid design that actually reminds me of a 12” Adventure Team Joe more than anything. When compared to figures like Flint and Gung-Ho, Hector X. Delgado’s head is tiny. However, it’s not so small as to be terribly distracting. Shipwreck seems to possess a protruding lower jaw and a heavy set brow which is in keeping with the original card artwork for the character. The molded beard appears to be thick as does the moustache and a mane of scraggly hair protrudes from underneath his sailor hat. The result is a fairly stern countenance—which is a bit of a far cry from his more jovial animated appearances. Still, the likeness works well enough for my tastes that I can accept this figure as Shipwreck. 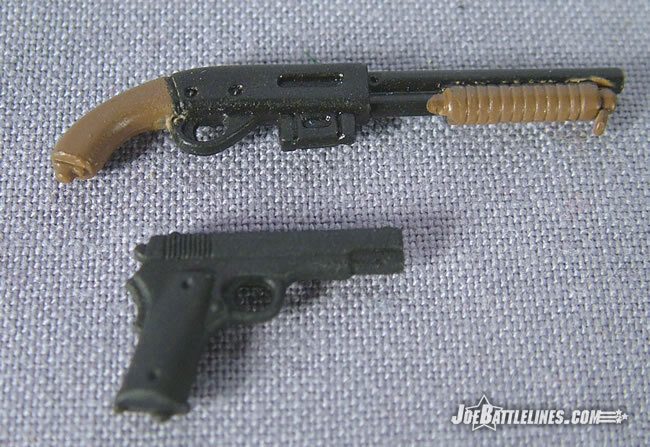 Included with Shipwreck are three weapons- a pistol side arm, an Uzi submachine gun (not pictured), and a miniature shotgun. I’ll be honest—I’ve never seen a scaled-down shotgun such as this before but the weapon looks formidable enough when gripped in the sailor’s hand. However, there is one other accessory that I’d be completely remiss in my duties as a reviewer if I didn’t describe it. Shipwreck is accompanied in the 25A line by his trusty sidekick/tormentor Polly—the green parrot with a mouth to match her owner’s. The previous release of Polly was fairly realistic in design; this new version has a more animated design that I would have suspected. 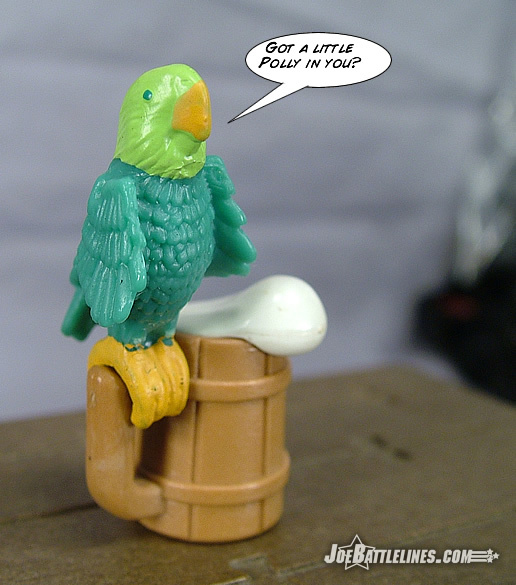 The parrot is molded in a fairly flexible hard rubber-like material which allows the bird to clamp onto Shipwreck’s beefy forearms rather easily. I’ve seen pictures where Polly is perched on his shoulder as well but I’d rather not stretch out the talons that much. Polly sits well enough on the figure’s forearms for me to be completely satisfied with her ability to perch. It just wouldn’t be Shipwreck without Polly and I’m glad to see her included here! As with many of the 25A figures, Shipwreck’s pelvis makes it impossible for him to fit in most classic ARAH-era vehicles. He’s got “v-crotch” syndrome like most of this line—which is a shame as it does limit some of the options that Hasbro might have had in terms of classic re-release vehicles. As it stands, any vehicles designed for this line would have to have some incredibly wide seating to accommodate most of the figures released thus far. As previously stated, fans can only hope that Hasbro is able to follow through on their statements about improving the articulation in this line in order to unleash the true potential of a GIJoe toy line. However, this topic has been “done to death” by this reviewer and so I’ll move on. My only other real issue with Shipwreck is the fact that he is designed with one closed fist instead of two open hands. 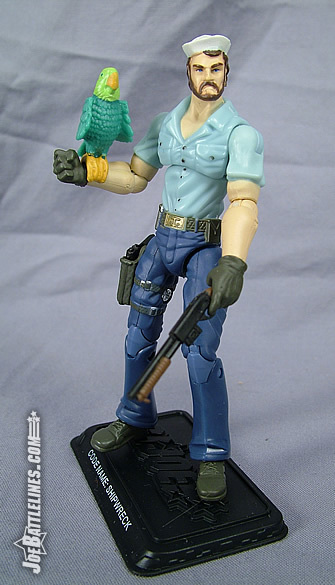 While the fist works for those poses where Shipwreck has to get “up close and personal” with a member of Cobra, it also means that a figure that comes with three included weapons can only ever carry two of them. (One in hand and one holstered.) Since that is the case, I’m wondering why Hasbro included the Uzi in the first place as it draws attention to the fact that Shipwreck is only able to hold one weapon at a time. 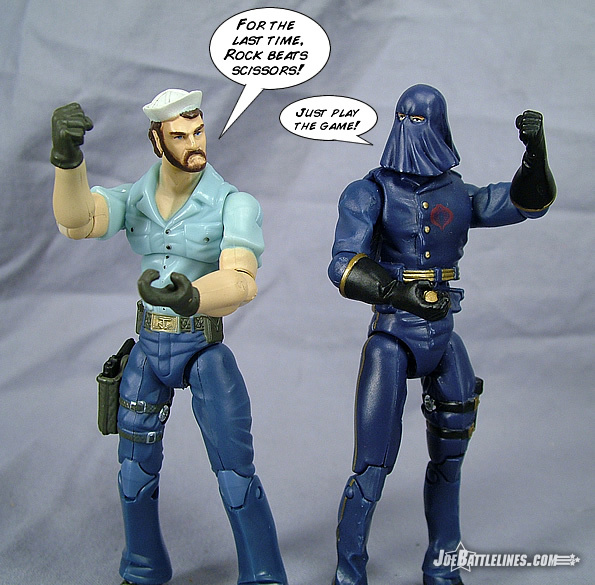 It was stated at the Collector’s Convention that Hasbro was opting for some more dynamic designs and that’s the reason that both Cobra Commander and Shipwreck feature one open hand and one fist. Still, unless I want to have a “rock, paper, scissors” tournament with these two characters I figure the closed hand to be a bit annoying. Oddly enough, the “Popeye” forearms that seemed so disproportionate in the early web pictures don’t look nearly so exaggerated in person. Shipwreck is one of those figures that I find is just plain fun to own. It seems that every time I sit down to pose this figure I end up channeling the Sunbow version of the character and comedy ensues. 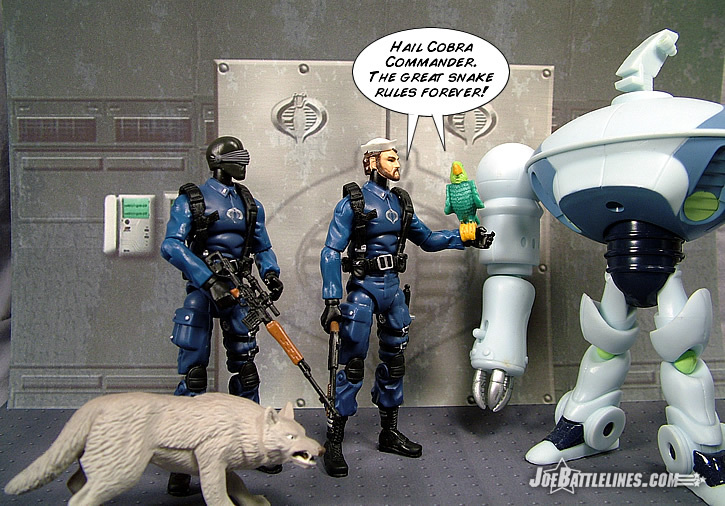 For some reason I always end up displaying Shipwreck next to Cobra Commander and the two of them end up as this bizarre “Hope & Crosby” duo in my head. Regardless of the articulation flaws (and my apparent mental issues), this is still a fun figure and a welcome addition to the 25A line-up. While not as poseable as figures like Snake Eyes, Storm Shadow (and all figures that share their bodies), and the newly released Zartan, Shipwreck is still fairly articulated—just as long as he’s not required to fit into anything. He’s an otherwise solid update to a fan-favorite figure and I ended up gravitating toward him far more than I would have thought possible. 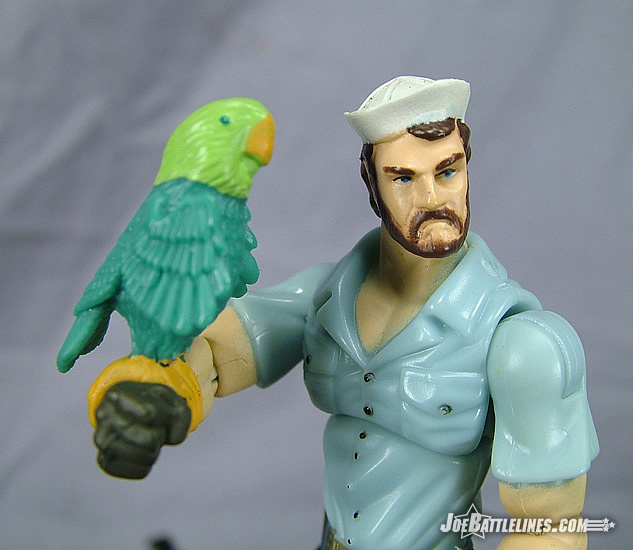 Besides, how can you go wrong with a guy who carries around a plastic parrot? I’d recommend Shipwreck to anyone who is collecting the 25A line.